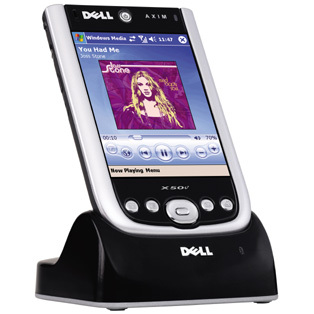 Bottom Line: The Dell X50v PDA is a powerful mobile device with a brilliant VGA screen. It does have some performance issues, but if you are in the market for a handheld should strongly consider the X50v. The first thing that sets the X50v apart from its predecessors is its new design. Ditching the shiny rectangular block characteristic of the X30 series models, Dell opted for a rounder design with more contrast when designing the X50 series. The result is an easier to grip, more professional looking PDA. The X50v measures at 4.7 inches long, 2.9 inches wide, and 0.7 inches high. At about 3 inches wide, the X50v is easy to cradle in your hand. And at 6.2 ounces in weight, it weighs just a little more than your average cell phone. Below we take a look at several views of the X50v. The front of the PDA features a glossy black finish with a silver border. The directional pad and quick-start buttons are also styled in silver, and are found towards the bottom of the handheld. Above the VGA display is the power button/charging indicator, as well as a flashing wireless and Bluetooth indicator at the top left of the PDA. 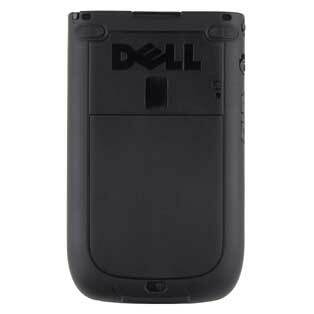 The back of the PDA is styled in a black matte finish with the Dell logo engraved in the top half. The battery hatch and soft reset buttons are located here. The top of the PDA contains the stylus, expansion slot, SD card slot, infrared port, and the headphone jack. The left side of the X50v contains the buttons for wireless enable, voice record, and input lock. It is also where the lanyard eyelet is found. The right side does not have any buttons. The uniform black finish coupled with a silver border make the X50v a stylish, but not overtly attention-drawing, PDA perfect for businesspeople on the go. 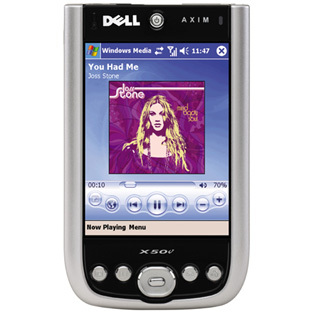 And with a matching dock (shown above), the design element of the X50v is solid without a doubt.